The Central Statistical Office said inflation had more than doubled since May - the last official data released. Since then the government has ordered shopkeepers to slash their prices and arrested anyone who has failed to obey. The Consumer Council of Zimbabwe has said the real year-on-year inflation is far higher than the official rate - claiming it was nearer 13,000% in June. Zimbabwe's economic crisis has led to an estimated three million people fleeing the country for South Africa. Unemployment stands at about 80% and there are mass shortages of fuel and foodstuffs. Businesses were forced to freeze prices in June as President Robert Mugabe's government tried to stem inflation. But some producers, fearing making a loss, cut production, meaning the move exacerbated shortages, leaving shop shelves empty. 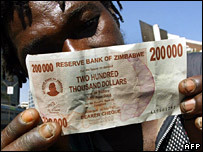 Last month a new 200,000 Zimbabwe dollar note was launched, in a bid to tackle the country's inflation, the highest in the world. The country's government has created a commission to find a way to control soaring living costs. But correspondents say that as long as Zimbabwe has a shortage of staple foods, including maize, food shortages are likely to continue. Critics have blamed President Mugabe's policies, especially the seizure of farms, for ordinary Zimbabweans' hardship. For his part, President Mugabe has accused foreign governments of trying to interfere in Zimbabwe's affairs - saying some businesses had raised prices without justification as part of a Western plot to oust him.